Paycheck. Set up automatic direct deposit contributions to myRA through an employer. According to a 2015 Federal Reserve Report, 31 percent of non-retired people said they have no retirement savings or pension whatsoever. Additionally, a 2013 report by the National Institute on Retirement Savings found that the average near-retirement household had only $12,000 in retirement savings. Among workers who do not participate in a 401(k) or other defined contribution plan, 42 percent say it’s because their employer does not offer one. Furthermore, among part-time workers, a 2015 BLS Economic Release found that 62 percent don’t have access to a retirement plan at work. 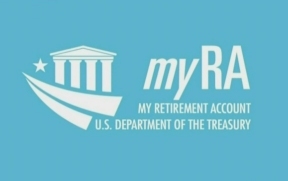 myRA is designed as a starter retirement account to help bridge the savings gap for many of myRA is a Roth IRA and follows the same eligibility requirements. To participate in myRA, savers (or their spouses, if married filing jointly) must have taxable compensation to be eligible to contribute to a myRA account and be within the Roth IRA income guidelines. For more information about myRA or to sign up for an account, visit myRA.gov.